An Afghan policeman at a checkpoint on the Ghazni highway, in Maidan Shahr, on Sunday. The American-led invasion of Afghanistan routed Taliban extremists from power after the terrorist attacks of Sept. 11, 2001. Nearly 17 years later, after tens of thousands of deaths, hundreds of billions of dollars spent and two White House administrations come and gone, those extremists are not only undefeated but seem as strong as ever. Since Friday, Taliban fighters have roamed the streets of Ghazni City, a strategic urban center less than 100 miles from the capital, Kabul, killing dozens of Afghan soldiers and police officers, cutting communications and severing the main highway from Kabul to the south and beyond. The Ghazni assault has demonstrated a stunning display of Taliban tenacity that belies the official Afghan and American narrative of progress in the war and the possibility for peace talks. It also has revealed remarkable bumbling by the Afghan military, including the wrong kind of ammunition sent to besieged police officers. Moreover, the siege has raised basic questions about what conditions the Taliban might accept for peace talks. What is happening in Ghazni? [post_ads]For months, residents and local officials in Ghazni, a city of about 280,000 people, had warned that the Taliban was surrounding the city and making inroads of control. Taliban fighters were even collecting taxes in some areas. On a visit in June, I found the city in fear — people avoided large gatherings. Assassinations were more frequent. 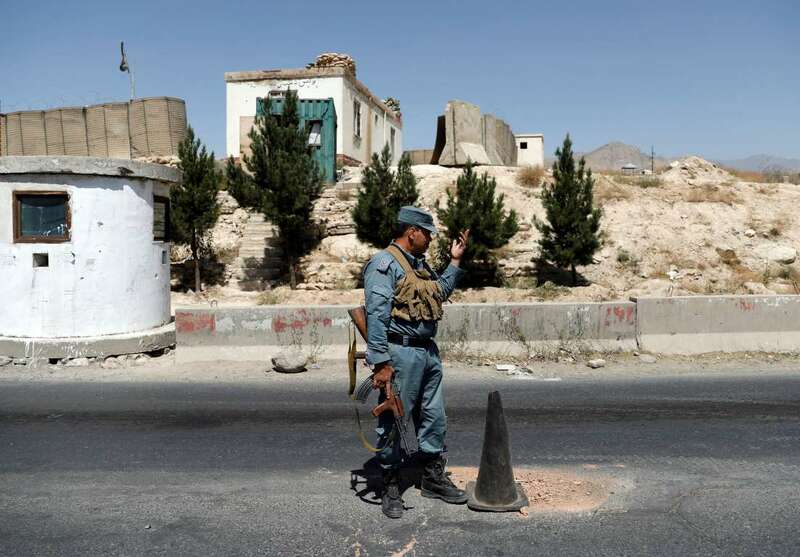 The police were forced to retreat and protect the main government facilities — the governor’s office, the Police Headquarters, the intelligence compound, the main prison — leaving the Taliban assailants to entrench themselves elsewhere. The Afghan minister of defense on Monday said that about 100 police officers and army soldiers and more 20 civilians had been killed. He put the number of dead Taliban fighters at about 200. Is this a sign of Taliban strength or government weakness? In recent years, as Afghan forces have largely taken ownership of the war from American forces, the Taliban have continued to gain territory. In some areas, they have struggled to hold a district or city, but in others they are firmly embedded. According to the United States military, the Afghan government controls just over half of the country’s nearly 400 districts — about 56 percent. Taliban insurgents control 14 percent, and the rest of the country is contested. A major deterrent to further Taliban gains has been American and Afghan airstrikes. The United States military alone has dropped more than 3,000 bombs in the first six months of this year. But air power alone is insufficient. Mr. Nabil said the internal political struggles of the Afghan government and its inability to outthink the Taliban’s moves before insurgents invaded a city were underlying problems. He likened the Ghazni battle to the 2015 siege of Kunduz, when it took more than two weeks for government-backed forces to retake the city. How is the U.S. military involved? The United States maintains about 14,000 troops in Afghanistan; they play an advisory role to Afghan troops and support a small counterterrorism mission. That is down from the peak of about American 100,000 soldiers in the country, at a time when the American military was leading the fight to defeat the Taliban in Afghan villages. Military officials said American advisers were on the ground with Afghan forces in Ghazni. American forces also have conducted about 25 airstrikes in the city. But much like the Afghan government, the United States military played down the extent of the crisis, in assessments completely at odds with the information from the locals. A statement by the United States military said, for example, that the main highway to the south remained open. But passengers on both sides remained stuck, and local Afghan officials said the highway was closed. It is unclear how many American troops are on the ground in Ghazni. But in cities such as Farah and Kunduz — assaulted by Taliban militants in 2015, 2016 and this year — the American military sent teams of Army Special Forces to call in airstrikes and fight alongside their Afghan commando counterparts. One American military official said he wasn’t surprised by the attack on Ghazni. Turmoil between the city’s Pashtun and Hazara tribes helped lay the foundation for the assault by the predominantly Pashtun militants. Local tribal dynamics, he said, is one reason the Afghan government struggles to hold territory. He added that these kinds of battles — heavy fighting in dispersed towns and small cities — were likely to keep happening well into the future, with American air power often acting as the deciding factor between victory and defeat. To the west in Helmand Province, American troops are preparing for potential attacks on American and Afghan outposts because of concerns that Taliban fighters may be preparing to expand their offensive in Ghazni. How will this affect peace talks with the Taliban? For months now, a new, urgent push has been underway to persuade the Taliban negotiate. Such efforts have failed before, but now there are some important differences. First, both sides announced a rare, overlapping cease-fire. Then, American diplomats met with Taliban representatives in Doha, Qatar, in what was seen as an icebreaker to ease the insurgent group’s long-held demand that it would first talk to the Americans without Afghan government officials present. The increase in violence and the siege of Ghazni come at a time when the Afghan government and its international partners have been pushing for a second cease-fire in coming weeks. Although the violence is unlikely to change those plans, it does complicate the government’s effort to counter critics of the peace efforts. World - U.S. Daily News: Why the Taliban’s Assault on Ghazni Matters for Afghanistan and the U.S.